As in a Blurb Book - they're so cool! And, as it happens, one of my favorite bloggers, Sarah at Classic Bride, is hosting a contest and giving away 5 Blurb gift certificates. I decided to enter a photo (below, taken by RHB Photography) that I'd like to use for the cover of our guest book. It makes use of one of my favorite engagement photos - and is consistent with the "look & feel" that we've established for our wedding (black/white/green color palette). 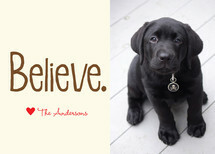 It also works very well with our Save The Date (a photo strip design!) - which I'll show more of next week. The green strip represents the spine of the book. Like the old saying goes, "a picture is worth a thousand words"...and then some! Keeping with yesterday's theme, engagement photos, I wanted to offer up an idea that can help make your photos more unique (and practical)...message boards! 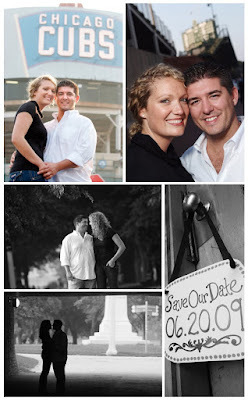 I encourage all of my clients to take full advantage of their engagement session. 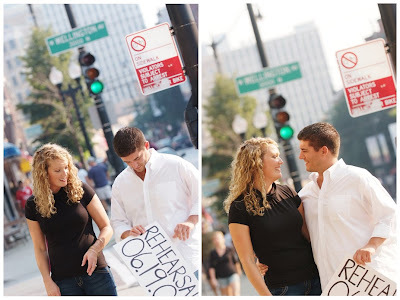 Besides coming away with some beautiful pictures, why not create a couple of signs that you can capture in your photos. Save The Date, Thank You and Rehearsal signs can help tell your story and make for a great start to pretty cards and invitations. These are some of my favorite photos from our engagement session. We included our black lab, Murphy, into this grouping. 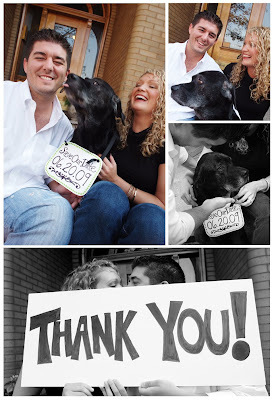 He helped communicate our "Save The Date" message with a cute sign we hung around his neck. Gosh, he really loved us that day! Ha! I'm also very excited to use the above series of photos to create our Rehearsal Dinner invitation. Check back in a few months for it! So, if you're looking for something different to do with your photos, consider getting the poster board and magic markers out to create a couple of signs. If you're not artistically talented, I'd be more than happy to help design, print or paint a special sign for you...just send me an email. Luke and I got engaged on May 17, 2008. After the hugging & crying, grinning & phone calling, booking & confirming... the FIRST thing we did was find a fabulous photographer! It all started back in high school...someone realized that my initials spelled KEG. How cool! KEG quickly became my nickname, and a common occurrence on the back of t-shirts, beer mugs and name tags. When it came time to create my senior portfolio in college, I needed a unique way to "brand" myself to the rest of the world. I thought, why not use KEG? While everyone else was using his or her full name (or something equally as boring), I decided to go the "cool" route and, alas, KEG DESIGN was born. It has been a small, growing freelance business ever since. I'm ready and roaring to go...bring on the blogging! Thanks for visiting Keg Design. I hope you'll stick around to read and (more importantly) see all of the cool stuff I've been working on. Check back daily (or weekly) for inspiration! We all experienced history last week. Be sure to get your FREE Obama sticker before supplies run out. All of the amazing Obama images (i.e. the famous HOPE poster and sticker above) were created by the very talented Shepard Fairey.